Be the first to share your favorite memory, photo or story of Laura. This memorial page is dedicated for family, friends and future generations to celebrate the life of their loved one. 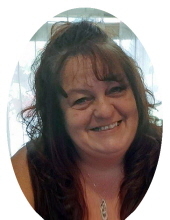 Laura Ann Mabry Ferguson, age 55, of Paris Lane, Morehead, passed away Thursday, March 28, 2019, at U.K. Medical Center in Lexington. Born September 19, 1963, in Morehead, she is the daughter of William Dale Mabry, Sr., and Diana Sue Black Mabry, who passed away January 20, 2017. In addition to her mother, she was preceded in death by a daughter, Rachel Pennington, and a brother-in-law, Matthew Smith. In addition to her father, Laura is survived by four sons, Waylon and Melissa Pennington of Cabot, Arkansas, Shane and Cynthia Pennington, Jordon and Tamara Pennington and Dakota and Jenna Barker, all of Morehead; five grandchildren, Sara, Kelsie, Jace, Aubree and Addilyn Pennington; expected granddaughter, Laura Caraline; and fiance’, David Simms of Morehead. Other survivors include two brothers, William Dale Mabry, Jr., and Tonya of Morehead, Phillip Mabry of Owingsville; one sister, Jenny Smith of Morehead; special friend, Jerry Ferguson; and numerous aunts, uncles, nieces, nephews, cousins, and friends. In addition to being a homemaker, Laura was the owner and operator of Tri-State Taxi. She was a former employee of Walmart and Kroger in Morehead. She was a member of Sharkey Baptist Church. Laura was a loving mother, grandmother, and sister who enjoyed taking care of her family. She was a mother to everyone and was always helping others. She also enjoyed gardening, taking care of her yard, traveling, and especially spending time with her children and grandchildren. She will be sadly missed. Funeral services will be conducted 11 a.m. Monday, April 1, 2019, at Sharkey Baptist Church with Pastor Harley Sexton, Jr., and Pastor Elijah Sexton officiating. Burial will follow in the W. D. Mabry Cemetery on 200 Hazel Tree Lane. Pallbearers: Waylon Pennington, Shane Pennington, Jordon Pennington, Dakota Barker, David Simms, Joseph Mabry, Lance Smith, Bret Smith, McKinnley Smith, Phillip Mabry, and Taylor Ferguson. Northcutt & Son Home for Funerals in Morehead is caring for arrangements. To send flowers or a remembrance gift to the family of Laura Mabry Ferguson, please visit our Tribute Store. "Email Address" would like to share the life celebration of Laura Mabry Ferguson. Click on the "link" to go to share a favorite memory or leave a condolence message for the family.